This page lists traditional thread-on freewheels only, as used on older bicycles. 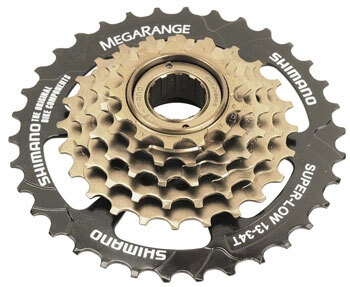 Most newer bikes use Cassette Freehubs, see our Cassette page. Not sure whether your bike uses a freewheel or cassette? Click here! Compatibility Notes. For frames with 120 mm spacing. Sunrace freewheels are very reliable. For frames with 126 mm spacing. Compatibility note! 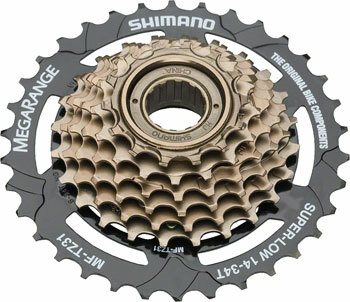 If your bike currently uses a 6-speed freewheel, it may be a good candidate for conversion to a 7-speed! The sprockets are closer together on a 7-speed, so the overall width is only a tiny bit wider for a 7-speed vs a normal 6-speed. In rare cases, you might need to add a washer or two to the axle for clearance in the smallest sprocket. If your bike has friction shifting , it will definitely work with either 6 or 7. If you have indexed shifting , generally you would need to replace the shifter. and the huge 34-tooth "bail-out" gear for the tough hills! The best available 6 speed model for general purpose. For frames with 126 mm or wider spacing. These will generally work on hubs made for 6-speed freewheels, sometimes with the addition of a washer or two. Excellent general-purpose freewheel. Almost any rear derailer will handle the 28 tooth big sprocket. "Alpine" design, with closer spacing between most of the sprockets for efficient cruising, and the huge 34-tooth "bail-out" gear for the tough hills. 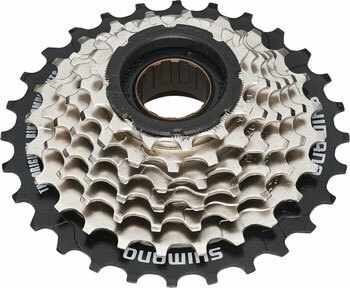 14 tooth top gear makes this most suitable for bikes with full sized (52 tooth) chainrings. Freewheels shown on this page fit the threads of all standard freewheel hubs, with the exception of some older French hubs that used a different size . Bikes made before the mid 1980s had "friction" shifting, where the shift levers move smoothly from one end of the range to the other, and only the rider's skill could get the derailer to line up properly with whichever sprocket was desired. If you use friction shifting, any brand of shifter works with any brand of derailer and any brand of freewheel with any number of sprockets. With indexed shifting, the shift lever has a "click stop" that corresponds to each of the gear postions. This makes for easier shifting, but limits your options for mixing different brands of components. Hubs originally intended for 5-speed freewheels can be converted to use 6- or 7-speed freewheels. You will generally need to add a few spacer washers to the right side of the axle, building it up far enought that the cone locknut can reach the frame dropout through the wider freewheel body. You will need to re-center the axle but probably won't need to replace it with a longer one. You'll also need to re-dish your wheel , and probably re-space your frame. If you're fairly handy, this is not an unreasonable thing to do. If your bike currently has a regular-spaced 6-speed freewheel, you can generally upgrade to 7-speed with little trouble. 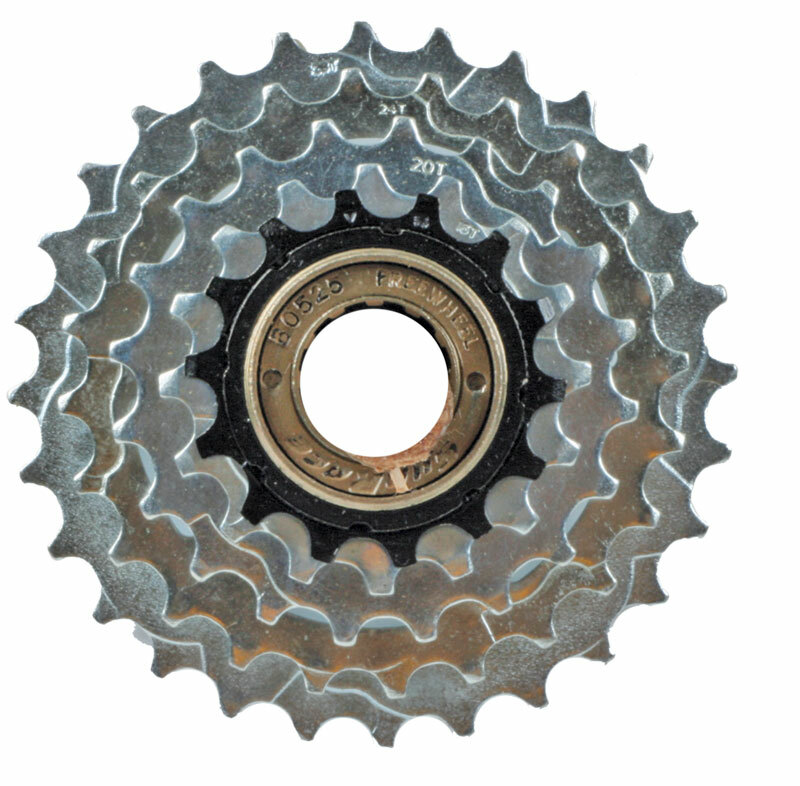 Since the sprockets are closer together on a 7-speed freewheel, the overall width is only very slightly wider than a regular-spaced 6-speed. You might need to add a thin washer to the right side of your axle to keep the chain from rubbing the frame in the highest gear. 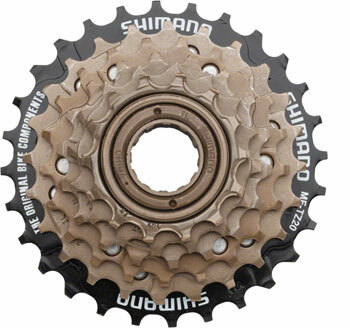 Shimano freewheels are by far the best value going. These are still in production, and their Hyperglide design makes them shift better than all others. SRAM (Formerly Sachs) freewheels were well made and durable, but have been discontinued by the manufacturer. SunTour freewheels were very high quality, very long lasting and pretty good shifting. SunTour(Japan)has been out of business since the early 1990s. SunRace freewheels are made in Taiwan. Second only to Shimano in terms of quality and reliability for current freewheels. We were the first southern New England bicycle shop with a Web site!